Combine cooked chicken, onion and celery, salt and pepper. Mix all dressing ingredients together and pour over chicken. 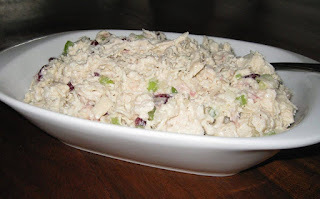 Add the dried cranberries (add right before serving or the chicken salad will turn pink). Serve with crackers or on lettuce. Note: Add more dressing if chicken salad is too dry. White meat tends to "soak" up the dressing.